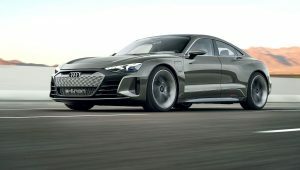 The electric Audi e-tron GT concept is a 590PS four-door coupé with quattro permanent all-wheel drive, and deliveries of the production version will start in early 2021. The e-tron GT’s technology has been developed in close collaboration with Porsche, and Audi’s performance subsidiary Audi Sport GmbH is responsible for transforming the car into a series-production model. Separate electric motors are fitted to the front and rear axles, delivering power via all four driven wheels through an electric quattro system – there is no mechanical link between the front and rear axle. The electronic control system coordinates the drive between the axles as well as between left and right wheels. There’s also all-wheel steering. The e-tron GT accelerates from 0 to 62mph in around 3.5 seconds before going on to 124mph in just over 12 seconds. The top speed is regulated at 149mph to maximise the range. Audi claims that the cooling system will allow the performance to be used repeatedly. The range of the concept car will be over 248 miles, based on the new WLTP standard. A lithium-ion battery with an energy content of more than 90 kWh sits under the floor. The recuperation system increases the range by up to 30 percent. The battery in the Audi e-tron GT concept can be charged in several ways: using a cable, or by means of contactless induction with Audi Wireless Charging. Here a charging pad with integral coil is installed permanently on the floor where the car is to be parked, and connected to the power supply. The alternating magnetic field induces an alternating voltage in the secondary coil fitted in the floor of the car, across the air gap. With a charging output of 11 kW the Audi e-tron GT concept can be fully charged conveniently overnight. Wired charging is much faster as the four-door coupé is fitted with an 800-volt system. This substantially reduces charging times compared with conventional systems that are currently in use, taking around 20 minutes to recharge the battery to 80 percent of its capacity, providing a range of more than 198 miles (WLTP). The e-tron GT concept can also be recharged at charging points with lower voltages, providing the driver with access to the entire charging network. By 2025 Audi will offer twelve cars with all-electric drive in the most important markets worldwide and achieve roughly one-third of its sales with electrified models. The SUVs within this portfolio include the Audi e-tron and the Audi e-tron Sportback due to make its debut in 2019.